On this tour, the culinary journey of just five cities will bring to the fore the variety and complexity of the cuisine but more importantly, you will get an in-depth view on the culture of the people that is inseparable from the food they eat. On this culinary journey, discover not just the food of India but the culture behind the food. Meet on arrival by our executive. Briefing of the tour by the executive and handing over of exchange orders/vouchers. Delhi, the capital of India comprises of conspicuously contrasting Old and New Delhi. Old Delhi was the capital of Muslim India between the 12th and 19th centuries and one can find mosques, monuments and forts related to Muslim history. Red Fort (Monday closed) (UNESCO WORLD HERITAGE SITE) Red Fort was built by the Mughal emperor famous for its architectural wonders one of which is Taj Mahal - Shah Jahan. Red Fort is famous for its delicately carved inlaid and Royal chambers. Enjoy the Cycle Rickshaw at Chandi Chock and visit Spice market. Also visit the Gali Paranthe Wali - (literally "the bylane of fried bread") is the name of a narrow street in the Chandni Chowk area of Delhi, India, noted for its series of shops selling paratha, a fried Indian bread, and now a popular culinary destination. Enjoy a cooking class along with a sumptuous meal with local family at their home in Delhi. A delicious home cooked meal prepared by you and our chef together during the class. Chat with her and get a glimpse of contemporary India in urban cities. Dinner is planned at the Indian Accent (on your own). The Manor awarded as the best restaurant for the 21st century. Savor the contemporary menu created by Chef Manish Mehrotra. He is innovative and creates a unique amalgamation using the freshest local produce. Mehrotra combines home style nostalgic tastes with unusual ingredients from across the world. In the evening enjoy the walled city authentic Rajasthani food which in itself is a brand ambassador for the grandeur of Rajasthan. One of the more famous dishes of Jaipur is Kota Kachori which is served with mint sauce. Another famous snack is the Khasta Urad Dal Kachori. Eating the Kachori accompanied with a glass hot tea (chai) will give you an exact idea about taste of the Jaipur street food. 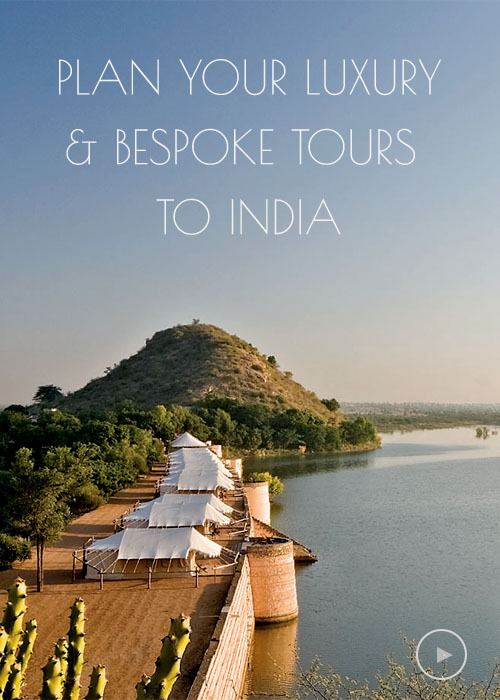 Morning depart for Amber fort - Situated atop the Aravali hills, it is the ancient capital of Jaipur and a magnificent example of Rajput architecture. We ascend to the fort on the back of a caparisoned Elephant. Return can be on foot or by shared jeep. Jantar Mantar - The Observatory, built by Raja Jai Singh in 1728. It is an excellent example of the marvelous precision wherein each construction has a specific purpose to measure the position of stars, altitudes and azimuths or calculating eclipses. The most striking instruments is the Sun Dial which is 90 feet high. City Palace Museum - City Palace is delightful blend of Mughal and traditional Rajasthani architecture. A part of the palace is still the house of the former Maharaja of Jaipur. Visit the various galleries displaying the armory, clothes and paintings of the Rajput clan. custodian of Dera Mandawa who is a keen observer of history, culture, religion, and current affairs. Try hands on cooking experience with the lady of the house. Learn to make Indian breads, Rajasthani barbeques and eggplant or potato dishes. The inquisitive tour members can have endless conversations with Thakur Durga Singh on a number of his pet projects like rain–water harvesting, biogas plants, solar heating and, even, healthy cooking. He would be more than delighted to share his experiences with you. Near to the Harshat Mata shrine is the step well Chand Baoli, which belongs to the 11the century AD. This step well is consider ed to be one of the most beautiful step wells of India. It is considered to be one amongst the deepest and largest step well of India. Chand baoli is a unique invention of Abhaneri. These Baolis are not an ordinary structure, they were wonders of architecture. The Chand Baoli has panels that are beautifully carved and inserted in to the sides. The stoned carved pillars were very strong in the past and were once used to support the pulleys for the purpose of drawing water. In the surrounding of this beautifully carved step well are several storeyed verandahs. Depart for Agra en route visiting Fatehpur Sikri - The Mughal Emperor Akbar built Fatehpūr Sikrī about 35 km from Agra, and moved his capital there. Later abandoned, the site displays a number of buildings of significant historical importance. A World Heritage Site, it is visited by most tourists. The name of the place came about after the Mughal Emperor Babar defeated Rana Sanga in a battle at a place called Sikrī . Akbar wanted to shift his head quarter to Fatehpur Sikri so he built a majestic fort. However, due to lack of water the city had to be abandoned and the head quarters returned to Agra. UNESCO World Heritage Site. Described as a most extravagant monument ever built for love, this sublime Mughal mausoleum is India’s most appreciated icon. The Taj was built by Emperor Shah Jahan as a memorial for his second wife, Mumtaz Mahal, who died giving birth to their 14th child in 1631. Construction of the Taj began in the same year and was not completed until 1653. Not long after it was finished, Shah Jahan was overthrown by his son Aurangzeb and imprisoned in Agra Fort where, for the rest of his days, he could only gaze out at his creation through a window. Following his death in 1666, Shah Jahan was buried here alongside Mumtaz. Late afternoon you will be taken for Agra Food Trail Journey, not just of taste, but of knowledge, as passionate people tell you about how this food has ended up on your plate. This tour is approximately 2 to 3 hours. Foodie exploration of the City of Agra meant for those who think from the Stomach. In the tour, we take you to the oldest and most popular food joints for tasting of a variety of Indian cuisine and chaat and show you a wholly different site of Agra, which you may not see being on any of the other tours. Dinner at Peshawari restaurant (on your own). Experience the wonder of this cuisine in Agra only at Peshawri, with a lavish spread of delicious kebabs – vegetarian and non-vegetarian that are cooked in myriad ways, a range of Indian breads – from the decadently indulgent to light and fluffy breads and of course, the inimitable Dal Bukhara – all of which is paired with an exclusive collection of wines and other beverages. Lucknow can very well be termed as a city that has carved a niche by attracting gastronomes for the want of discovering and re-discovering the Awadhi Cuisine. Till date Lucknowites spend the most of their earnings and time on their kitchens. Lucknow is one place that has a colony of chefs called 'Bawarchi Tola' and then there is a full street where one can find the best from Lucknow's very own kitchens. We take you for this evening walk and allow you to hop-in, hop-out of the traditional roadside eateries making you try the best that is on the menu. This is a guided tour with our own set of cutlery and basic dining gadgets that allow you to experience the best of the best in the restaurant without having to worry about how to eat without a fork or to wipe your hands clean after you are done. *This walk is essentially for meat eaters and is conducted everyday except Thursdays and Sundays at 1845 hrs. It starts from Akbari Gate and ends at Akbari Gate. The total duration is about 1.5 hours. This walk also remains suspended during festivals such as on 10th Mohorram and 6 days after Eid. Breakfast at hotel and post breakfast, we visit the architectural marvel of age, La Martiniere School which was designed by the Frenchman Major-General Claude Martin as a palatial home. Even to this day, Claude martin is a revered personality in the city of Lucknow. Driving Past Sadat Ali Tomb, driving past ‘Chatar Manzil’ – a part of this palace was built by a French architect, Claude Martin (as this palace has restricted entry we can see it from outside from within the car) we enter the gateway of world’s most unique architecture, 'Asifi Imambara'. This monument was built as a relief measure for a devastating famine, in order to provide employment to the subjects of the state by Nawab Asif-ud-Daula'. This is the world’s biggest hall that is devoid of any pillar support, wood, iron beams or concrete walls. Salute the “Nawab” (Prince) lying in peace inside and proceed to see his noble work. Also see the 'Rumi Darwaza' or the Turkish Gate and the Asfi Mosque. Also visit the Husainabad Complex - The Clock Tower is the highest Clock Tower in Asia and in some ways superior to its counterpart, 'Big Ben'. Today the clock stands motionless but has witnessed all times, the good, the bad and the ugly. Now enter the Babylon of East, The Husainabad Imambara - known for its beauty and pieces of décor. This was built in 1840 by Mohammad Ali Shah and is still considered to be a sacred address by the natives. The beautiful chandeliers, silver seat, sandalwood décor and calligraphy on the walls all are so creative. Admire each one and bow down to the Nawab and his Mother sleeping inside. Lunch will be at a local restaurant, The Royal Café and try out the fusion cuisine at this eatery that once served the American and the British soldiers during the world war times. Today this restaurant is extremely popular with the locals and tourists alike. Depart for visit Lucknow Residency a place where speechless walls are known to speak the gruesome tale of the 1857 mutiny. The sprawling British campus witnessed nothing less than 3000 deaths to keep the Union Jack flying. Yet the British could not defend their domain and the buildings were lost to the high spirited and enthusiastic Indians who fought till their last breath. The trees, bullet sprinkled walls, unusable canons, worn out firearms all cry aloud with the burden of deaths that were witnessed here. We also visit the graveyard to pay our homage to named and unnamed soldiers who gave up their lives in the defense of The Residency. Also visit the Dhobi Ghat to admire the freshly embroidered Chikan Garments that come for a wash before they deck up the glitzy showrooms and emporia. The riverfront looks like a colourful canvas with a display of ‘flying colours’, when the washed clothes are hung in the sun to dry before they enter the last lap of their journey into the showrooms. Optionally visit a Chikan Showroom if at all you have to shop for this hand-embroidered garments. preparation with exotic spices and garnishing with dry fruits. This cuisine was introduced to India by the deputies of the Mughal Emperor, namely, the Nawabs of Awadh, who were originally inhabitants of Persia (modern day Iran). They enjoyed a particular diet of grains, fruits, dry fruits and vegetables that were available in their country. So the Mughlai style of cooking was further refined in Lucknow by the Nawabs by adding exotic flavours of saffron and dry fruits. For a small group of 6 to 10, we will visit Coquina - an 'artisanal' kitchen that offers a combination of traditional and modern cooking by knowledgeable individuals, who are cooks by passion and not by profession. You will learn about this Passion Cuisine, cook for yourselves under supervision and then enjoy the meal. For a group of 10 or more, dinner is planned at Lucknow's Khajurgaon Palace. Khajurgaon is owned by the former royal family of Raja Amresh Kumar Singh. The palace is one of the few remaining Lucknow vintage properties from the British era that is still well preserved and known for its quintessential Awadhi architecture. The huge durbar hall with beautiful paintings and murals in natural colours and its Belgian chandeliers create a beautiful backdrop to the evening. The dinner, which is hosted by the family, is traditional Lakhnavi from the word 'go', together with a narration of Lucknow's royal history by one of the family members. Enjoy cocktails, followed by a home cooked Awadhi meal, that brings alive the city's famed culinary traditions. Hyderabad, one of the stunning cities in India, has successfully retained its past glories and grandeurs. Be it the ‘Shahi’ charm of the old city, the delicious cuisines , everything offers a unique and unmatchable identity to this state. This 4-5 hours tour offers a splendid way to witness and experience the old world charm and authenticity of Hyderabad. On assembling at the Charminar at around 10am or 3pm, embark on this tantalizing tour of Hyderabad with a cup of Irani Chai and Osmania Biscuits. Known as two of the best and most delicious specialities of the city, one cannot afford to miss either of them on a Hyderabad trip. You can savour upon other delicacies and confectionaries like puffs, pastries, stuffed bread like dil-pasand and dil-khush. Walking towards Patherghatti, sample some of the best varieties of dosas and head towards a local spice market which is known for its exotic and flavoursome spices. Experience the variants in Hyderabadi spices and know the secret of its delicious cuisines! Post this, visit a nearby market and delight on delicacies like Nahari Kulcha, roti kheema and bhaja curry. After 11:30am, you can also sample the most authentic Hyderabadi Biryani in this market and get your taste buds greedier. In addition to this, you can also sample naan and marrg (soup), lukhmi (patty) with mincemeat, kebabs and pattherkaghosht. After a scrumptious day of sampling and savouring different cuisines of Hyderabad, conclude this food tour by relishing desserts like double kameetha, khubanikameetha, malai and several others. Salar Jung Museum has the largest one-man collection of antiques in the world, exhibiting over 35,000 objects of art such as Chinese Porcelain, Aurangazeb's Sword, Daggers - belonging to Queen Noor Jehan, Emperor Jahangir and Shah Jahan, Sculpture, Indian paintings and Persian Carpets. The most notable of these are the Veiled Rebecca, Bezzoni's translucent white marble statue, the Arms section, the Jade section and the Oriental Section. This Fort, originally built by the Kakatiyas, the rulers of the neighboring state, was made with mud. Later, the Shahis converted it into a marvelous piece of architecture using advanced acoustics wherein sound signals could pass from the entrance of the fort to the top without the use of any electric gadgets. There is a sound and light show in the evening which is quiet popular. The grand fortress is protected by three formidable lines of defense. The first, an outer fortification made up of granite blocks. The middle wall surrounds the base of the hill and the innermost one follows the contours of the highest ridge. The Fort was famous for its great hoard of diamonds, mined nearby. The Kohinoor diamond was a celebrated jewel of the Fort, now a part of the British Crown Jewels.